The International Loebner Prize 2013 Contest in Artificial Intelligence (AI) will be hosted for the first time on the island of Ireland by The University of Ulster on Saturday, September 14th, 2013. Loebner Prize 2013 will be held at the Magee Campus during the CultureTECH digital technology, media and music Festival and City of Culture 2013 celebration. The Loebner Prize Contest seeks to find the world's best conversational chatbot computer program. It is the first formal instantiation of `The Turing Test' which is named after Alan Turing, the brilliant British mathematician who also developed basic research on the theoretical foundation of computing science. Loebner Prize 2013 will be hosted by The University of Ulster in collaboration with Universities in the USA (New Mexico), France (LIMSI-CNRS), Denmark (Aalborg), England (Exeter, Sheffield), Queen's University Belfast, University College Dublin, Dublin City University and the IEEE Computational Intelligence Society UKRI chapter. Each year an Annual Prize and Bronze Medal is awarded to the most human-like computer. 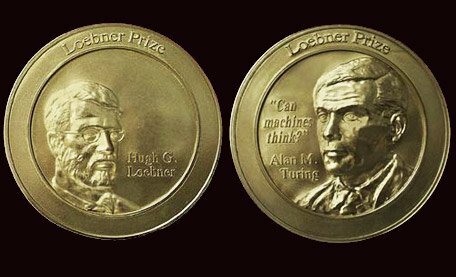 Loebner Prize 2013 Annual First Prize is: US$ 4000 and Annual Bronze Medal, Second Prize: US$ 1000, Third Prize: US$ 750 and Fourth Prize: US$ 250. All prizes are sponsored by New York Philanthropist, Dr. Hugh Loebner. Loebner Prize 2013, in collaboration with Foyle Learning Community and TeenTech CIC founded by Science broadcaster Maggie Philbin (of BBC's Tomorrow's World) and Chris Dodson, Chairman of the Institute of Directors (England South), also includes a Junior Loebner Prize in which the judging panel consists of school pupils between 12 and 14 years old. The Loebner Prize contest, first inaugurated in 1991 at The Computer Museum (Boston, USA), has been hosted internationally at locations such as: Carnegie Hall (NY, USA), The Science Museum (London), The Powerhouse Museum (Sydney, Australia), Bletchley Park (England), Dartmouth College (NH, USA), Georgia State University (Atlanta, USA), California State University (LA, USA), University College London, Surrey, Reading & Exeter Universities (England), Flinders University (Adelaide, Australia) and Hugh Loebner's apartment in New York City (USA). Loebner 2013 will be held on Saturday, 14th September, 2013, with CultureTECH 2013 running from Monday 9th to Sunday 15th September. The Contest will precede an International Workshop on, ``Waiting for Artificial Intelligence…'', also being held at Magee Campus on Sunday, 15th September, 2013. Loebner 2013 is directed by Professor Paul Mc Kevitt of the Computer Science Research Institute (CSRI) at Magee and produced by Dr. Hugh Loebner, together with Production and Location Crews and casting of Contest Entrants and International Expert and Junior Judging Panels. Professor Paul Mc Kevitt said: “Hugh Loebner's choice of Ulster for this competition has not been by chance. Ulster's Computer Science Research Institute (CSRI) has had an association with the field of Artificial Intelligence (AI) research for many years, with much of the research in Computer Science on three campuses focusing on this topic. “Professor John McCarthy from Stanford University (USA), who named this field at the Dartmouth, USA conference in 1956 spoke at the Irish Artificial Intelligence and Cognitive Science Conference (AICS-1997, Magee). “Professor Noel Sharkey, Professor of Artificial Intelligence and Robotics at The University of Sheffield, previously awarded an Honorary Doctorate (D.Sc.) by the University of Ulster (2006) and Visiting Professorship to the CSRI, is a member of the Loebner Prize 2013 international expert judging panel. Dr. Hugh Loebner said: “Ulster's research strengths in AI and new developments in the use of AI combined with creative arts and technologies in serious computer games, online learning and emotion modelling makes it an ideal host for Loebner Prize 2013. “The CultureTECH 2013 international digital media and creativity Festival and The City of Culture 2013 celebration provide an appropriate backdrop for staging The Loebner Prize. Caption: An 18kt solid Gold Medal (pictured) & $100,000 prize is awarded to a machine that generates responses that are indistinguishable from a human.